Jenga is one of the most loved games. Anyone who has ever played this game knows the indulging factor it has. Well it might be your loved game but competing in Jenga can give anyone a hard time. The game was created by Leslie Scott almost 30 years ago and its name is derived from Swahili word for to build. Read on to know about the professional tips shared by the creator herself to have an upper hand in the game and beat your competitor easily. These tips are the same for giant jenga as well. Mind games are never made to play with strength or with attacking strategy. These games are designed to make use of brain and patience so that you learn about strategy and planning. Leslie advises that Jenga is a game which is more about losing and less about winning. In other words she means you should never go for the bricks that are struck. Keep playing with easy bricks and as you precede the struck bricks may ease up with change in weight distribution. Take time and plan for a strategy before going for the big take. 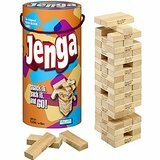 Jenga is not designed to be a game that has some kind of fit all solutions. As every brick has different weight and size, the tower you make up by assembling them will be different every time, says Scott. So every time it’s a new Jenga game you are playing, any strategy that worked before will not be fit in present game. According to Scott most of the players try to make the tower as tall as possible. But she says it’s a faulty strategy as the higher the tower will become the chances of its unstable fall will increase. Your best move should be to remove bricks keeping the tower as small as possible. One basic rule of playing Jenga is to use only one hand but it never means that you can’t swap hands. According to Scott swapping hands give you more stability. Also she advises to use your forearm to balance the tower and brace it with your hand. This will provide increased stability. Often than not you will run out of bricks and it will appear there is no going forward. But the interesting secret is that there are always bricks available; you just have to look at the right place. According to Scott look for the layers where there is no center brick. In this layer move the other two bricks together and remove the one on the outside. Jenga is the brick placement game and you can never win your opponent if you don’t put bricks on top first. The best strategy to sabotage the tower is to balance it on one side. These are some useful tips to beat anyone at Jenga from the creator of the game herself. Pay attention but be more dexterous and don’t always plan to use the same strategy.